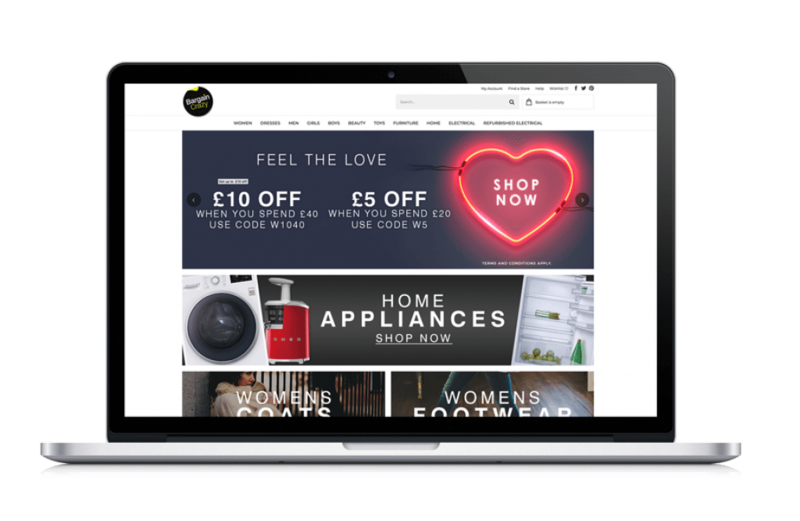 The Freeman’s name has been a trusted brand in home shopping since the since the 80s, it has kept up to date with modern technology offering a great website for online department store shopping with personal credit accounts available. The Freemans catalogue stock clothing ranges for the whole family as well as a significant Home Electronics and homeware section. You can find popular brand names from Oasis and Adidas to Samsung and Sony in the Freemans catalogue. The interest rate for catalogue credit with Freemans is an mid-range 34.9% APR variable with a 25% discount on your first order, this is with a personal shopper account, but Freemans also have a flex account which allows you to buy now and delay payments for up to a year. Delivery is free for all products across the UK but there may be an extra charge for next day or stated day options. Returns are very simple and can be made via the Post Office, Hermes ParcelShop or the local courier. Freemans is an ideal catalogue that looks after the whole family and the home in one place, and with interest free options it is an ideal way to budget for all the need of the modern home. Fashion World is a good all-round online department store style catalogue, it carries clothing and footwear ranges for the whole family as well as great home and lifestyle sections with modern technology well catered for in the home electronics chapters. You can also find great gift ideas and experience days in the Fashion World catalogue. There are some very popular High Street brands as well as designer collections throughout every page. Fashion World offer catalogue credit with a personal shopper account, but it does have a very high interest rate of 58.7 APR variable unless paid in full at the monthly statements, one of the higher interest rates found online. Standard delivery is free with all orders over £40 when using the Click and Collect option otherwise standard delivery is from £3.50 with options for next-day stated days and Sundays at an extra cost. You can buy an unlimited delivery package for the year for less than £10, this is very handy if you are a regular shopper with this catalogue. All returns are free within 14 days from delivery and this can be done easily via your courier, your local click and collect depot, Post Office or Hermes ParcelShop service. 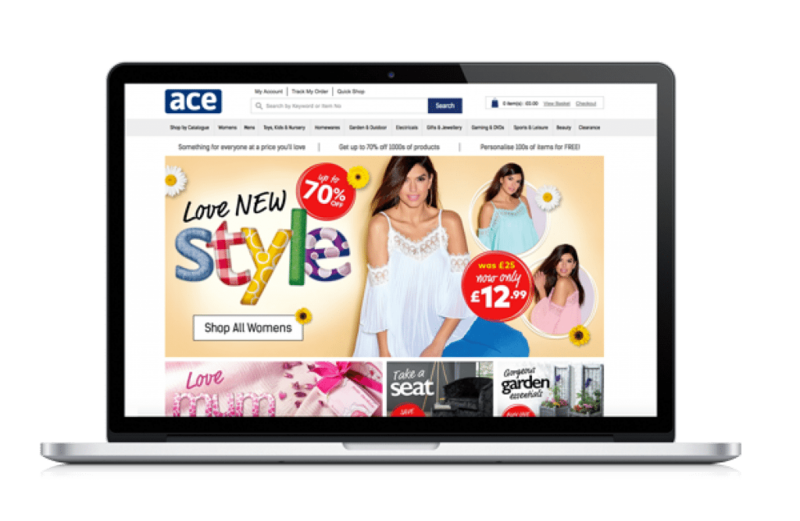 Ace catalogue is a good all round online shopping experience, It carries designer brands such as Armani and Nike and it also has a very good personalisation service for many products. You can find clothing for men women and children with a great footwear range also. Ace has many fantastic home and garden products, all at quite competitive prices with the High Street. The Christmas season has always been a very busy time for the Ace catalogue as it has a huge array of gifts for all the family including many toys on the children’s wish list. For home electronics Ace are well stocked with brands from Sony and Apple available, the higher priced items available with a buy now pay late scheme, to delay payment for up to a year from purchase. Ace has standard postage at charged at £4.99 with no option for next-day or chosen day delivery. You can return products within 14 days, but postage is at your own cost at present. A variety of credit is available from a personal account to buy now pay later the interest rate with a 41.2% APR. Ace are in the mid to higher range of interest rates available for catalogue credit. Argos has long been the go to store for many household items as well as gifts and jewellery. They carry a wide range of well-known brands at very competitive prices and with interest free credit available in the form of an Argos credit card. The clothing and footwear section is growing rapidly alongside their massive array of all home electronics, fitness and lifestyle products, for both indoor and outdoor living. 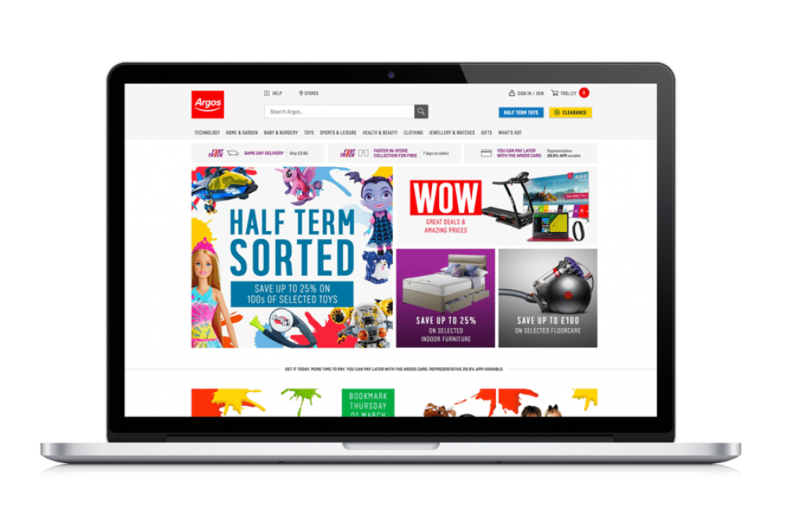 Argos is one of the best catalogues online with the support of the national High Street stores across the UK. They offer fantastic interest rates, one of the lowest found with online catalogues, at only 29.9% variable APR. Standard UK delivery starts at £3.95 with named day, including Sunday, and next day delivery options to choose from. Returns are accepted up to 30 days from purchase and you can also return directly to your nearest store. With Argos you also have the voucher scheme which gives a £5 voucher for every £50 spent online or in store. The mobile app and a clear and easy website make Argos one of the best online catalogues for everything related to the home, as well as great gift ideas for all the family. Bargain Crazy are primarily a discount store catalogue they do not hold a massive range of stock at any one time, but you can find huge bargains of up to 80% on some very well-known High Street brands and designer labels. Bargain Crazy do not offer any type of catalogue credit, but they accept payments from all major credit cards and PayPal. All products must be paid for in full before delivery. standard delivery is charged at £3.95 with no option for next-day or named day deliveries. Returns are also not free at a charge of £1.99, via the courier or click and collect service at a local Hermes Parcel Shop. Returns charges will be added to your product refund. The products that Bargain Crazy stock, range from women’s, men’s and children’s clothing and footwear to outdoor and indoor living lifestyle products. The Bargain Crazy online catalogue is well worth looking at on a regular basis as the products available change very quickly some with limited or discontinued stock. Bargain Crazy also have a good selection of refurbished home electronics, that come with a good warranty and you are fully covered by the distance selling regulations for all products on sale. The Bon Marche catalogue does not offer any form of catalogue credit and all purchases must be paid in full before delivery. You are also able to use Bon Marche gift cards with the online catalogue as well as in store. Standard delivery is free on all orders over £35, the next day delivery is charged at £4.49 and there is also an option for international delivery, not found with many other online catalogues. The returns policy is free within 14 days and you can return by your courier, click and collect point or to the nearest Bon Marche high street store with proof of purchase. 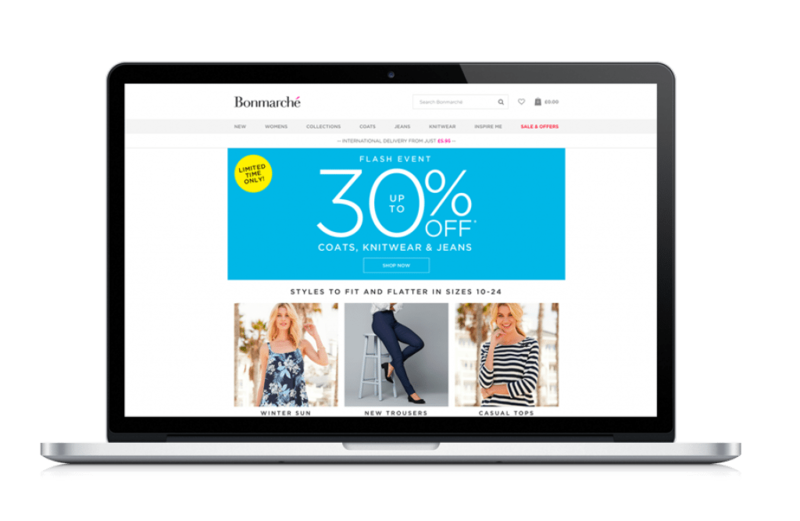 Bon Marche are a good catalogue for seasonal fashion with flash sales online. BonPrix are part of the online catalogue chain that includes Kaleidoscope, Curvissa and Look Again. When you have a personal account with BonPrix, you have access to all 9 online catalogues within the chain giving you a wide range of products, brand names and designer labels to choose from whilst only maintaining one catalogue credit account. BonPrix clothing line is sized from UK 6 to 32 for women and includes a good children and menswear section. BonPrix catalogue alone only carries clothing and footwear lines but with the access to the other catalogues you are able to buy home and lifestyle items including home electronic goods that can be added to your personal account. BonPrix have a mid-range interest rate at 34.9% variable APR and there is a 25% discount on your first order. Delivery is not free, but there are offers through the year that do include free postage. Standard delivery starts at £3.99 with next day, Sunday and named day options. Returns are free within 14 days by the Post Office, Click and Collect or via the Hermes courier. 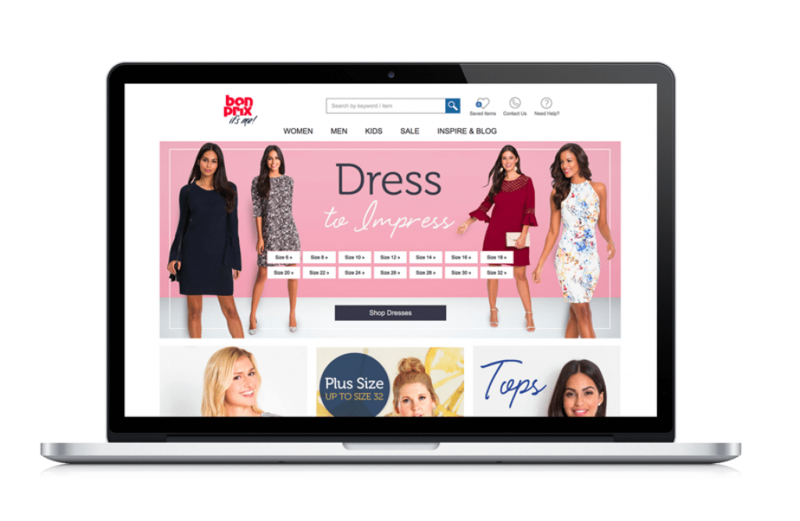 BonPrix is a good mid-priced womenswear catalogue with fair interest rates and the ability to access 9 other online catalogues. 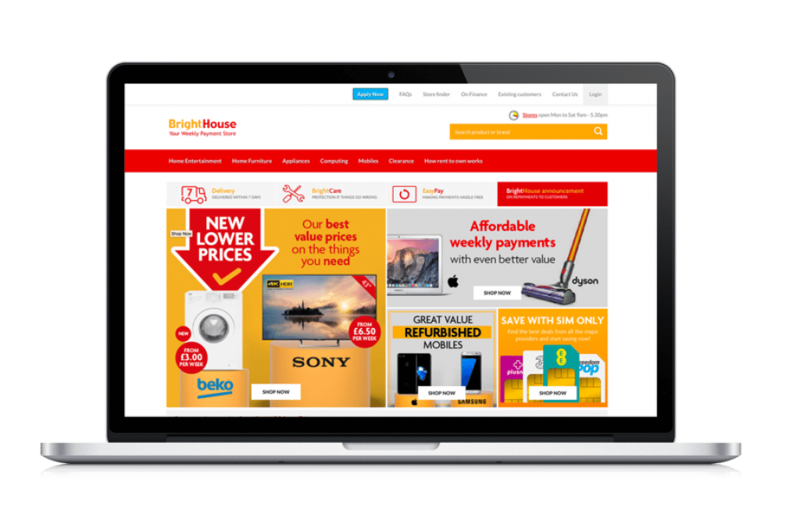 The BrightHouse catalogue backs up the national High Street showrooms and carries the latest in home electronics, furniture and kitchen appliances as well as all modern gaming consoles and the latest mobile phones. With BrightHouse there is no opportunity to pay in full you are only ever entering into a credit agreement. The interest rate that BrightHouse carries is one of the highest on for online catalogues at a huge 69.9% variable APR with no benefit for early repayment. BrightHouse is a rent until you own credit allowing an alternative way for customers with poor credit to buy high value items for the home. BrightHouse have warranties and insurance for peace of mind and you can also upgrade many items such as computers or mobile phones during the term of the credit arrangements. The Grattan catalogue has been a trusted name in retail for over 100 years, and with their customer service being their major priority, having a personal account with Grattan could not make online shopping any easier. They stock over 46,000 products from home electronics and furnishings together with a huge array of clothing and footwear lines for both men and women. The children’s section is extremely comprehensive, full of smart and attractive items for both the school and playwear. There are many designer labels and popular brands contained in the Grattan catalogue from Oasis, Joe Brown and Disney to name a few. 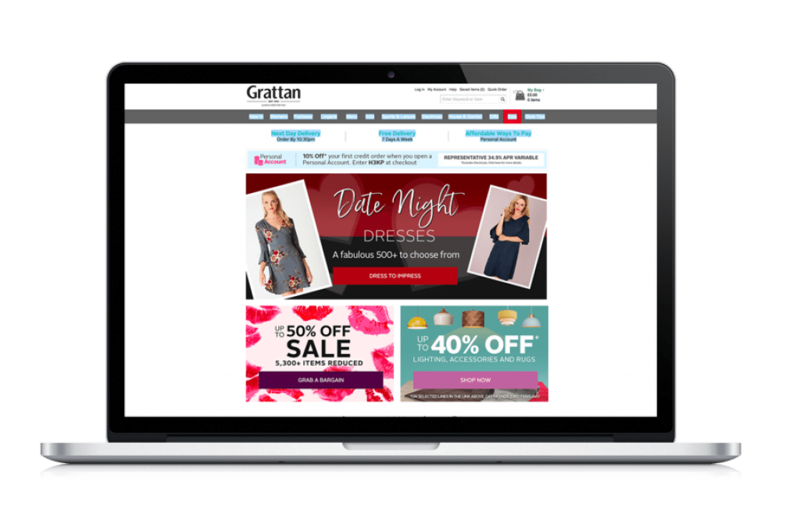 Grattan offers catalogue credit in the form of a personal account and has an average interest rate of 39.4% APR variable, in line with the majority of online catalogues. Every order has free standard delivery between 3 to 5 days with next day delivery at an extra cost. You have the option of the Post Office, the local courier or the Hermes ParcelShop should you need to make any Returns. All returns are a free within a 14-day period from delivery. Grattan is well established and well run and is an all-round high achiever for anything home related. 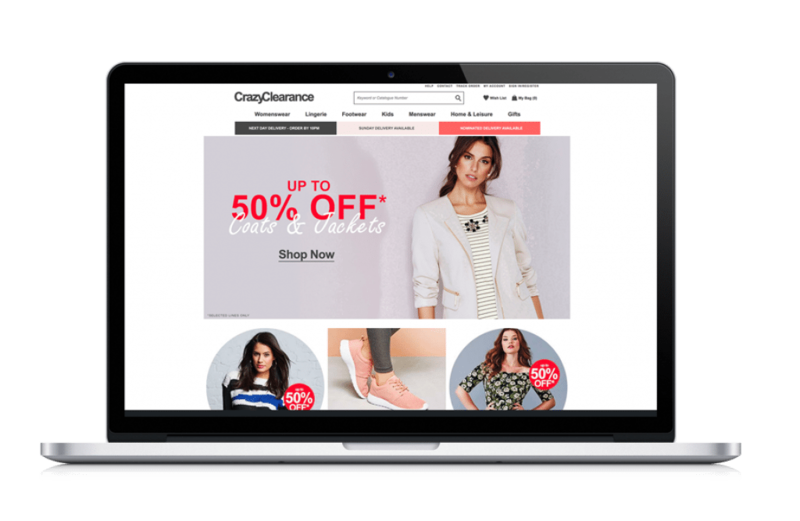 The Crazy Clearance catalogue is the online sale store for many affiliate sites under the JD Williams name, it offers up to 50% discount on many items stocked throughout the whole chain. Crazy Clearance does not offer any form of catalogue credit but does accept all major credit and debit cards. Payment must be made in full at the time of ordering before delivery. Products range from women’s and menswear, childrenswear, footwear to home and garden, lifestyle and fitness products. Many popular brand names as well as designer labels can be found and with this clearance catalogue being primarily a sale and discount store, many items are discontinued or limited stock. The delivery cost is calculated at the time of checkout but is not free, you can have next day or stated day delivery with only one postal charge per order, worth considering when placing multiple orders. Returns are free within 14 days and can be used with the Hermes courier and ParcelShop service, the post office or your local click and collect depot. The Crazy Clearance catalogue is worth checking regularly as there are many flash sales and special seasonal offers with further discounts available throughout the year. 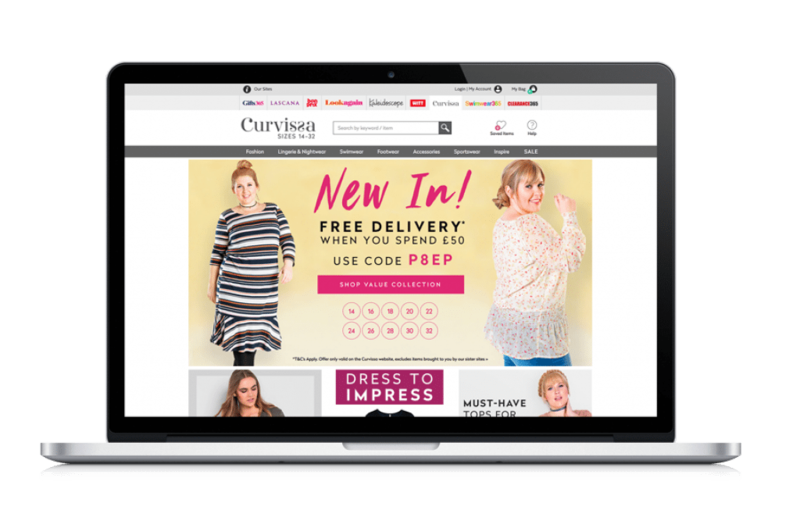 The Curvissa catalogue is a very popular online store, catering for plus size womenswear in the UK from sizes 14 to 32, there are huge clothing, footwear, lingerie and accessory product lines and a very helpful shape calculator to help tailor your wardrobe. The Curvissa catalogue also belongs to the same chain as Look Again and BonPrix, with this catalogue you have access to all nine affiliate catalogues to use with your own personal account. Curvissa carries many popular High Street and designer brand labels with an excellent accessory range to include bags and sunglasses. As yet Curvissa do not offer any home or lifestyle products currently, but with access to the other online stores you will find these items elsewhere in the chain. Catalogue credit with a personal account has an interest rate of 39.4% variable APR and is at an average interest rate amongst online catalogues. The personal account is able to be used with purchases from an affiliate catalogues with the same payment and interest terms. There is no free delivery, but you can have next day stated day or standard delivery from £3.99. Returns are simple with the Post Office, Hermes ParcelShop, courier or your local click and collect depot. 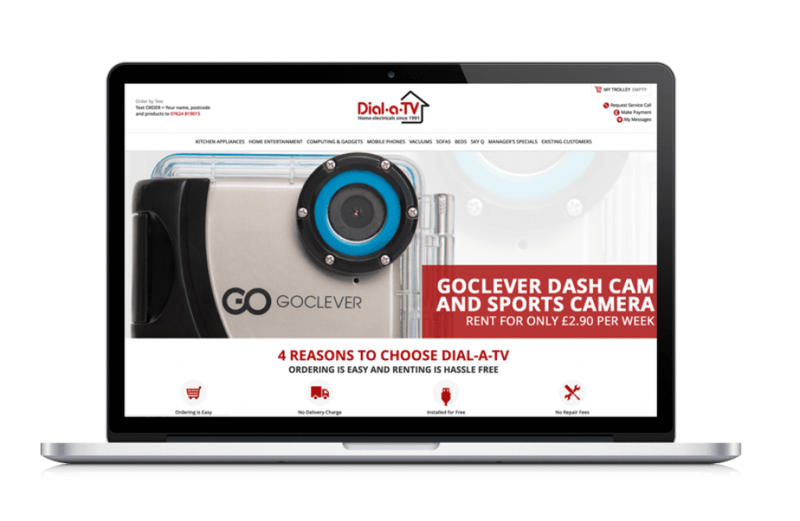 The Dial-a-TV online catalogue has been developed from a well-established electronics rental company, the products available are to rent over certain periods of time, you will not actually own the items outright. The products available from Dial-a-TV cover all aspects of Home Electronics from TVs to Blu-ray players, mobile phones through to kitchen appliances and vacuum cleaners. All major popular brands from Samsung to Apple can be found to rent from Dial-a-TV. The rental system can be a good way to stay on top of new technology with the safety of having all upgrades and repairs covered under your rental terms. Dial-a-TV is a good option for those with poor credit. You will undergo a basic credit search before delivery and once you have accepted the terms you can pay monthly or weekly to suit your budget by direct debit or standing order. Deliveries are across the UK but there are certain postcodes that may not be available. Although delivery is free there is a £12 administration fee to be paid in advance which covers the cost of the credit check. There is a 30 day returns policy should you need to return any item and you are fully covered by the distance selling regulations. The House of Bath catalogue is in the premium range of department store catalogues and it belongs to the JD Williams chain. This catalogue is focused on Home and lifestyle products as well as a good range of mobility aids. The House of Bath catalogue is very well laid out and gives lots of inspiration for home decor. This catalogue also has a fantastic range of outdoor living products and in the garden section you can find summer houses and barbecues. The current selection of clothing lines stocked is quite small compared to other online catalogues but as they are constantly updating their site it is well worth taking a look as they often carry lines that others online catalogues do not stock. House of Bath do not offer any form of catalogue credit, but payments can be made with all major credit or debit cards, all items and postage must be paid in full at the time of order. Delivery charge is added at checkout and is usually a standard 3 to 5 day delivery. Returns can be made through the Post Office, PostLocker, or your local courier. The House of Bath catalogue has a very independent feel with their product selection. The Jacamo menswear catalogue is a sister catalogue to Simply Be and really caters for plus size customers. 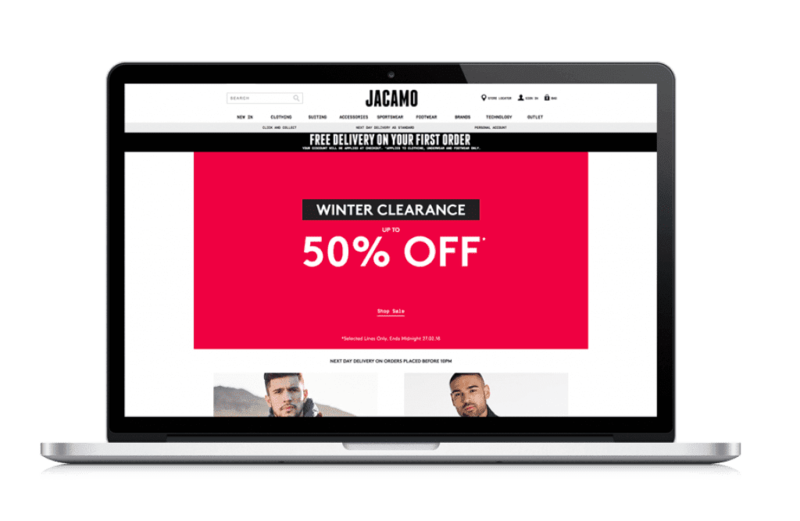 Jacamo is primarily menswear and are highly invested in Ethical Trading as well as bringing cutting-edge and exciting designs for non-average sizing. Jacamo carry over 70 well known designer brands and sizes range from XXS to 5XL. Footwear is high on the list with sizes up to UK 15 easily available for the modern man. Jacamo also has an extensive Home Electronics section with every gadget and mobile devices available, with the option of purchasing gadget insurance to cover any mishaps. The credit options with Jacamo menswear are one of the best found within the internet shopping catalogues, you can open a personal account with a very low 24.9% variable APR, interest free if paid in full on your statement date. Delivery is free with the first order and then at a standard rate of £3.99 but you do have the option of paying an unlimited yearly postage charge at £9.95, very handy for a regular shopper. Returns are free within a 14 day period and are made very easily by calling your local courier taking to the post office or dropping at the Hermes parcel shop depot. JD Williams is a popular household name in online shopping, it has a fantastic range of women’s clothing collections to flatter all sizes between 12 and 32. This catalogue also has the option of a personal style advisor facility when opening a personal account, this offers a lifestyle compliment service that combines your unique tastes and acts as a virtual personal shopper. The JD Williams catalogue has many well-known brands as well as some designer labels from Joanna Hope to Black Label it also carries a very good home and lifestyle selection of products to choose from with home electronics included. Catalogue credit is available in the form of the personal account with her initial £400 credit limit there are flexible payment options to suit everybody and the APR rate is mid to High range at 39.9% variable. there is a speedy online application form to fill in for a personal account. JD Williams was the first online store to use the Royal Mail for its deliveries and now delivery is free on all orders over £40 and you can place orders until 10 p.m. for next-day delivery. Returns are free via Hermes ParcelShop, courier or the local Post Office. The John Lewis catalogue is at the premium end of online department store shopping it is well known for stocking high quality indoor and outdoor living goods. John Lewis have a huge range of designer clothing for all the family and many of the John Lewis brands are exclusive and cannot be found in any other online retail catalogue. John Lewis has combined forces with Waitrose and both are internationally recognised for style and quality. John Lewis has also branched out into home broadband and insurance services. 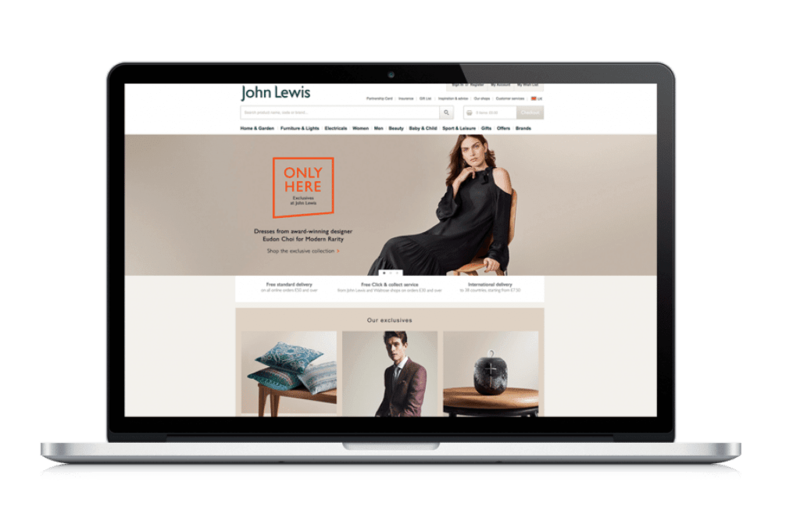 Catalogue credit is in the form of a John Lewis MasterCard account and this gives you one of the best interest rates found in online shopping at a very low 18.9% APR variable. With this MasterCard account you are able to have a 9 month interest free period and loyalty points giving back in store vouchers. 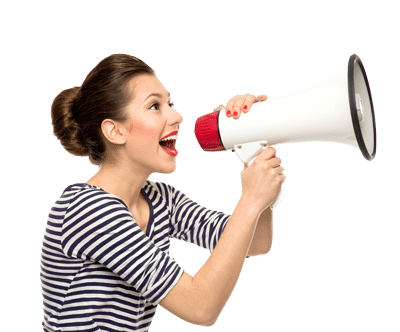 Standard courier delivery is free on all orders over £50 but next day and stated they deliveries do come at an extra cost. Returns can be made conveniently at any Waitrose store at the Post Office or by the Collect+ Point. Returns are free but there may be a charge for larger 2 man courier items. 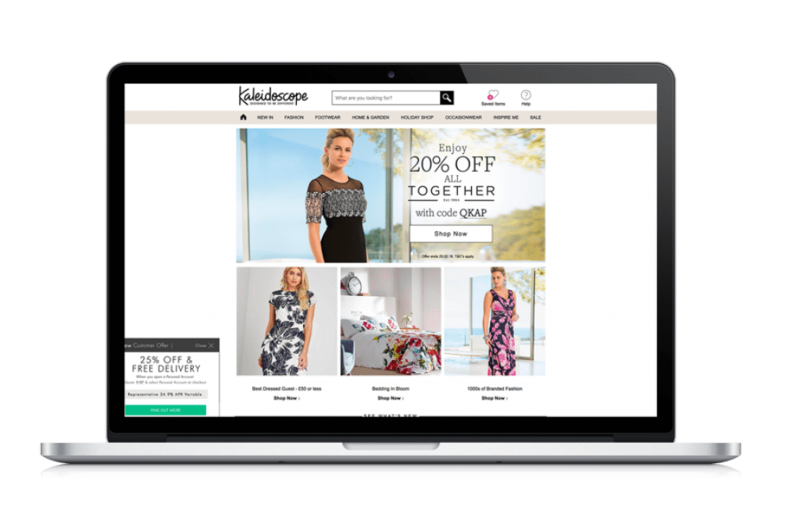 The Kaleidoscope online catalogue is part of a chain including BonPrix, Look Again and Lascana, when opening a personal shopper account with Kaleidoscope you have access to all nine of the sister catalogues. Kaleidoscope was primarily a womenswear catalogue but has now grown to include children and menswear along with a competitive range of home furnishings, outdoor living products and home electronics. You will find many popular brands within the pages of the Kaleidoscope catalogue, and the competitive prices do not undermine design and quality. They have also made good use of technology by introducing a mobile shopping app. Together with the rest of the catalogues in this chain the interest rate is set at a medium 34.9% variable APR, plus a 25% discount and free delivery with your first account order. You can purchase any item over all nine catalogues with the same interest and terms as your Kaleidoscope account. Standard delivery is charged at £3.99 with next day and selected days charged extra, you can opt for the Click and Collect service with Hermes, again with the standard charge. All returns within 14 days are free at the post office, Hermes ParcelShop or by courier, your account is then credited within two weeks. La Redoute is a French online catalogue and have been at the cutting edge of Fashion since the late 1800s. They have an unrivalled collection of designers in their clothing sections with quality and style very different to most other online catalogues. They have now branched out into homewares to offer a very stylish and contemporary furnishing and fabrics. As yet La Redoute does not offer home electronics or kitchen appliances, so are still primarily a clothing catalogue for the entire family. With La Redoute there is the option of opening a personal credit account and the APR is in the medium to high range at 39.9% variable. There is a 21 day try before you buy policy and there is also the EASY 3 credit option to pay over three instalments for higher priced orders. Because deliveries are dispatched in France there is no option for next-day delivery and it is an average five day period for standard delivery. Postage is free to a click and collect depot but charged at £3.99 for home delivery. Returns are free within the 21 days and can be carried out at the Post Office, click and collect depots or with the Hermes courier. The Look Again catalogue belongs to the same chain as Curvissa and Kaleidoscope and enables the personal account holder to shop from any of the nine other catalogues within the chain. Look Again have a massive product range of clothing for the entire family as well as everything you could need for the home and garden they also stock a great range of home entertainment and electronics. 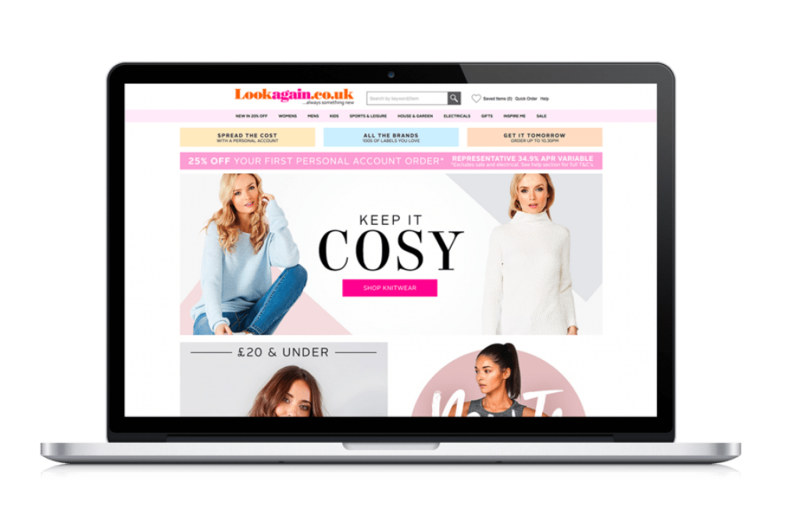 Many popular High Street brand names are found in all sections and with being able to access the other catalogues you are sure to find everything you need with the ability of paying with one account. The personal account catalogue credit with Look Again has an APR of 34.9% variable interest free when paid in full, this is in the medium range for online catalogue interest rates. You are able to order up to 10 p.m. at night for next day delivery and standard delivery starts at £3.99. Look Again use the Click and Collect service as well as full parcel tracking. All Returns are free within 14 days from the date of delivery and this can be done by taking parcels to the Post Office, using the courier or the Hermes parcel shop service. 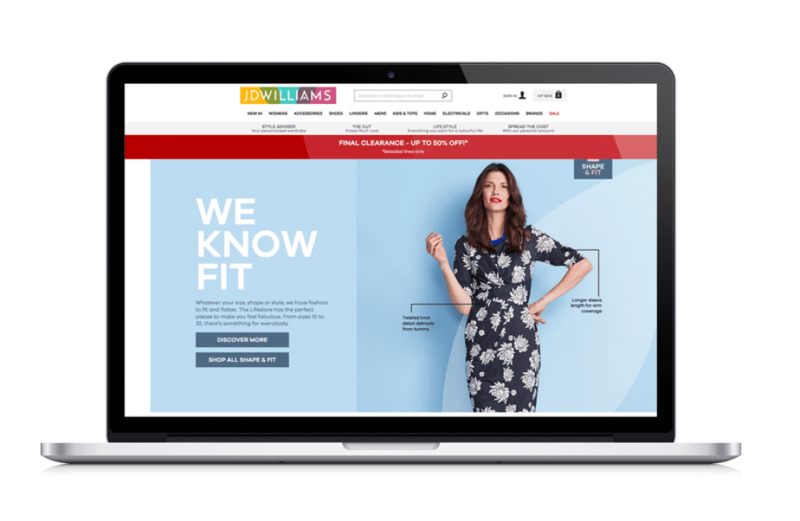 The Marisota online catalogue is part of the JD Williams franchise and is aimed at the entire family and home. The clothing ranges for men and women offer style and quality with on trend fashion with very generous plus sizes up to UK 32 for women and 58” waist for men. The Marisota catalogue has an excellent home electronics section with the latest in smart home technology alongside furnishings for every room in the house. 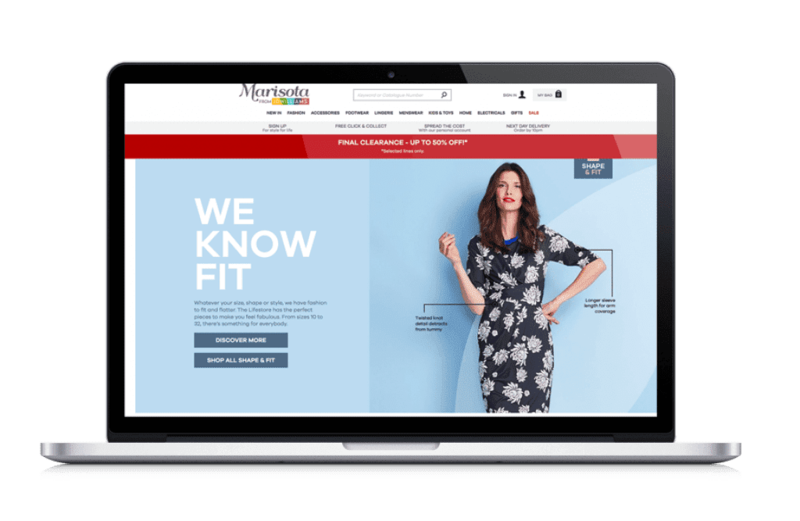 Many popular brands can be found in the Marisota catalogue including Ben Sherman and Joe Brown, Sony and Apple. Catalogue credit is available with Marisota in the form of a personal shopper account, but the of APR 58.7% variable is one of the highest online catalogue interest rates to be found, something to consider if you are in danger of not settling your account on time. Marisota offer free next day delivery as standard on all orders of £40 or more and you can order up to 10 p.m. In the evening, delivery is charged at £3.99 for smaller orders. Marisota also uses the Click and Collect service for both deliveries and Returns, but you can also return very easily to the Post Office or call your local Hermes ParcelShop courier. 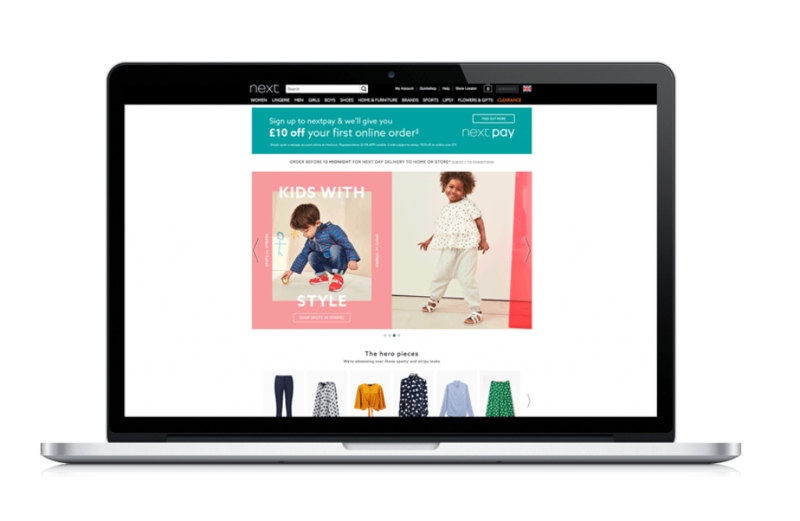 The Next online catalogue is a well-known and trusted brand in retail and offers a wide range of clothing collections for both adults and children under their own trusted Next brand. Following the huge success of the clothing lines, Next has branched out into home and lifestyle goods that still follow the uncompromising ethics of durability and design that has proved to be successful in the clothing ranges. You can find quality brand names amongst the home appliance sections, although currently Next does not an extensive home electronic and technology section. 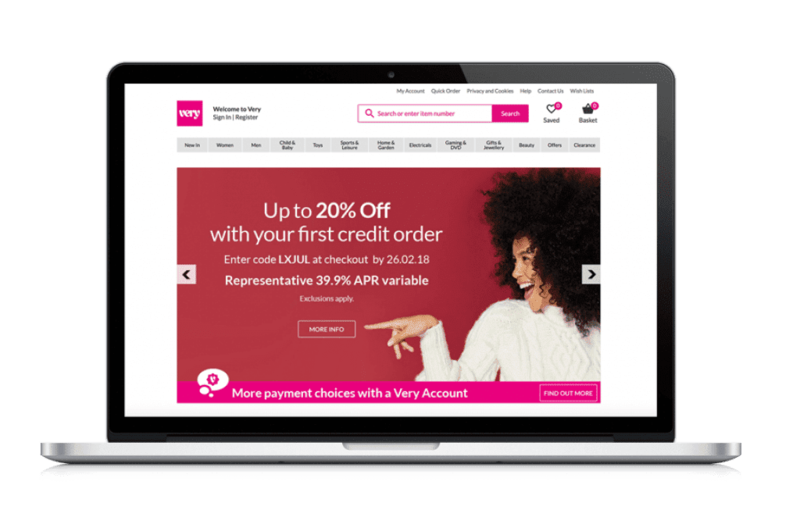 The Next online catalogue offers a personal credit account in the form of a NextPay card and with a very low APR of just 22.9% variable, is one of the lowest interest rates found in online shopping. You are able to order up until midnight for next-day delivery and you receive three months next day delivery free of charge when opening an account. You can also purchase unlimited postage for less than £20 for the year. Returns couldn’t be easier as you can take to your nearest Next store for free, by returning with the courier is at £3.99, but if the entire order is returned then this is credited to your account. 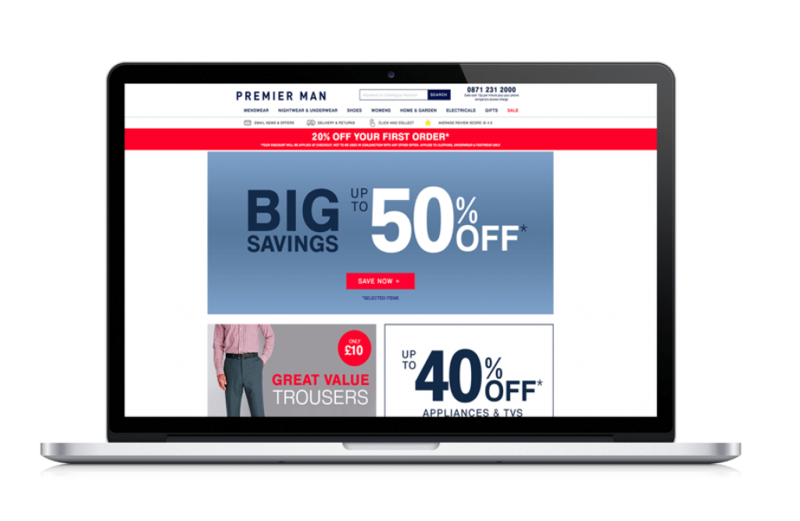 The Premier Man online catalogue has very strong ethical trading standards and they have now introduced womenswear, home, lifestyle and fitness ranges to their long-standing menswear catalogue. You can find great brand names such as Regatta, Wrangler and Ben Sherman and sizing is up to a 54” waist and a UK 32 for women. Premier Man have also made a big impact with their accessory ranges where you can find stunning jewellery and a great collection of bags and footwear. In the Premier Man homeware sections, you will find beautiful fabrics with contemporary styled furnishings. Premier Man is a very sophisticated catalogue, with an eye on design at their heart. Premier Man does offer catalogue credit in the form of a personal account, but the APR is at the top end of interest rates found online at 58.7% variable. There is a try before you buy policy of 14 days before goods ordered are added to your account. Standard delivery is at £3.50 although if using the Click and Collect service orders over £40 are free. All Returns within 14 days are free and you can use the Post Office, your local courier or the PostLocker depots for 24/7 drop-offs. 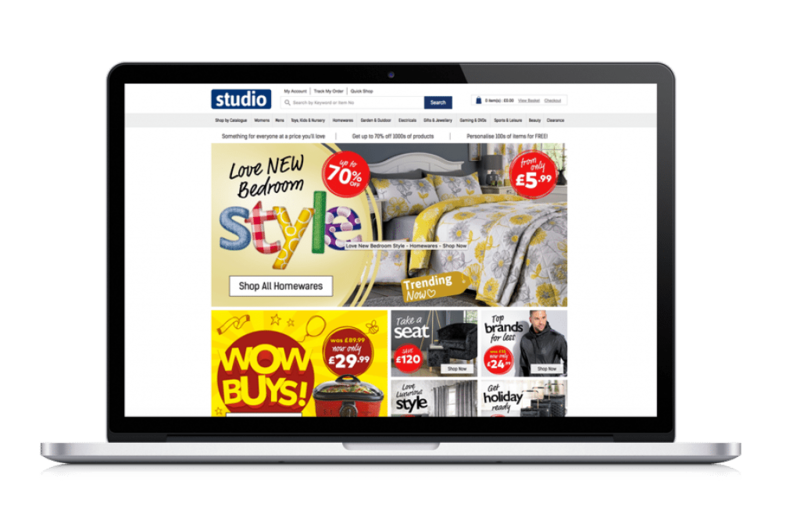 The Studio catalogue started as Studio Cards and was mainly targeted at the Christmas season with gifts and wrapping, it has now evolved to bring all home related products to the catalogue and made it relevant year round. You still have the great personalisation service for many of the gifts found in the Studio catalogue. Some very big and popular brands from the High Street have come on board with the Studio catalogue and it now has a fabulous garden and outdoor collection to widen the ranges of products on offer. Studio still do great 2 for 1 offers over their card and gift wrapping ranges and it is well worth taking a look if only for Christmas gifts. Studio have a personal credit account option, but the APR is 41.4% variable, towards the higher end of all interest rates found on the internet with other catalogues, but if the account is paid in full with each statement then interest is not applied. All deliveries are charged at £4.99 per order and there is no option for next day delivery. Studio have yet to catch up with the rest of the online catalogues as returns can only be made at the Post Office at your expense. 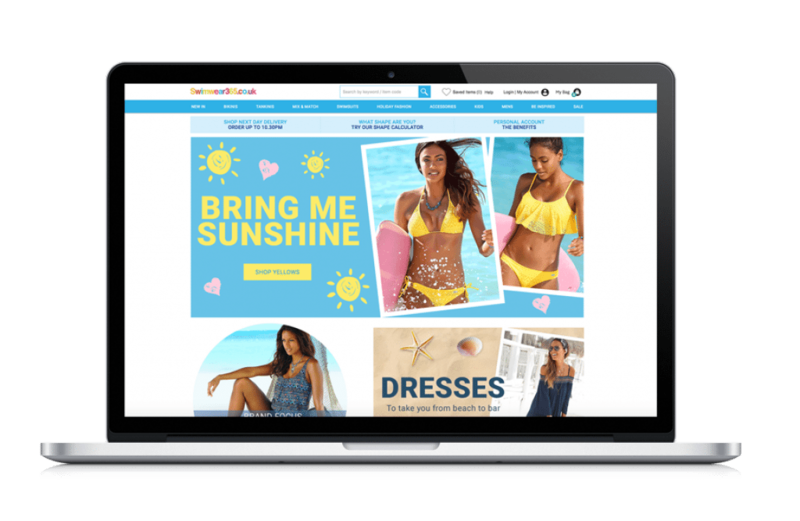 The Swimwear365 catalogue is aimed at the summer season and holiday market, they belong to a group of nine online stores with Look Again, Curvissa and Kaleidoscope being amongst their partner catalogues. When taking a personal account with swimwear365 you also have access to all other catalogues in the group, all with the same terms of purchase. Swimwear365 have a great range of travel items and accessories and the swimwear designs are size that to UK 32 and promoting body confidence is high on their priority. Swimwear 365 carry a good range of popular High Street names in all sections including footwear and accessories. There are no home and electronics sections with Swimwear365, but they do look after all health and beauty needs. A personal account with Swimwear365 has no interest charged when paid in full, but the APR is 34.9% variable on instalment payments. You are able to order until 10 p.m. for next-day delivery and delivery starts at £3.99, there is a Click and Collect option for deliveries also. Returns are accepted free within 14 days from delivery and can be made by courier, Post Office or at a Hermes ParcelShop or local PostLocker point with a 24/7 drop off service. 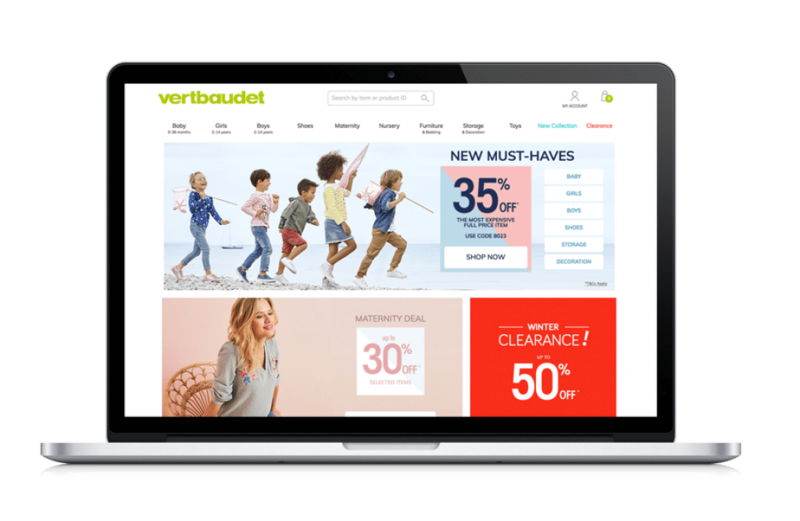 Vertbaudet are a French family focused catalogue with clothing lines for children to the age of 14 and a fabulous maternity wear section that is both comfortable and stylish. You will find everything needed for a new baby including the nursery furniture and some great ideas and tips for parenting scattered throughout the catalogue. The Vertbaudet catalogue is full of not only stylish and colourful clothes for children but they are also very durable and of high quality. You can also find beautifully designed furnishings and fabrics for the entire home with a touch of French chic as expected from this stylish catalogue. The Vertbaudet catalogue does not carry a big array of popular brand names, it tends to stay with its own designers. Vertbaudet do not offer any form of catalogue credit but you can pay for your goods securely online at the time of order and delivery is free with orders over £49, for orders less than this, standard delivery starts at £3.99. As all parcels are dispatched from France there is a 5 day delivery period. The Click and Collect option is also available with Hermes. Returns are free within 30 days at the Hermes ParcelShop service locally is the only place returns can be made. 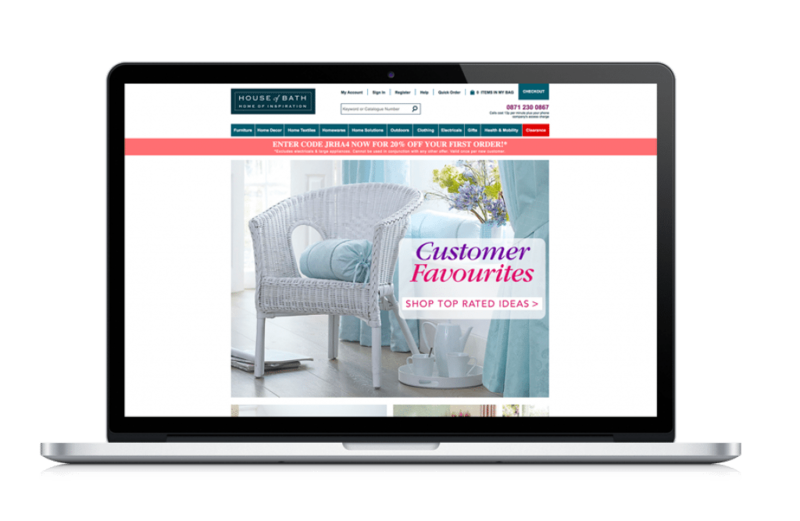 The Very online catalogue is one of the best known catalogues currently in the UK, it caters for the entire family and home with some of the UK’s most popular High Street names to be found throughout the catalogue. Clothing ranges cater for the fuller figure up to women’s UK size 32, as well as bringing the best in cutting edge designers and catwalk fashions easily to the online shopping world. With the Very catalogue you will find all modern technology in the home electronics section and indoor and outdoor living are really well catered for in the home and lifestyle departments. The Very catalogue often has discount events where savings of up to 50% can be made and it also has a permanent clearance section. There are a few options for catalogue credit with Very, you can pay by three instalments over the year or a personal account with monthly statements. The APR is at the higher end of rates at 39.9% variable, but there is a huge 20% discount on your first order. Deliveries are not free unless using the Click and Collect service and standard delivery starts at £3.99. Returns can be made at the post office or the local Collect+ points.